Thank you very much for your interest in my EUC, but I will not be shipping this wheel. 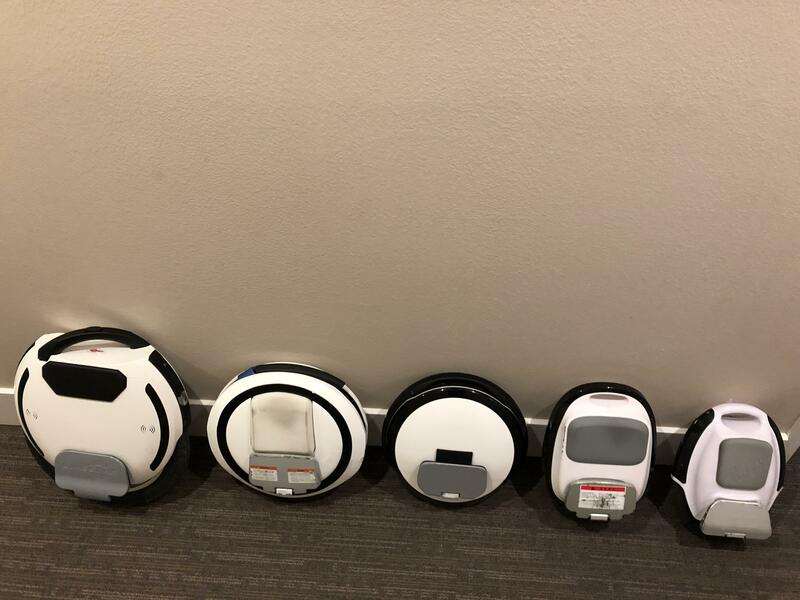 Here are the facts for my King Song KS16S for sale in the SF Bay Area for $950: I am the original owner of this EUC and I purchased it from eWheels.com in January 2019. It has 137KM (85 Miles) on it. The battery charges to 100% (840wh) and has only been charged with the original charger at 1.5 amps. It has never been dropped or in an accident, or had an electrical malfunction. It has never needed replacement control board, motor or batteries. It has no tire wobble, cracks, or creaking, and never had a flat tire. This model came with black trolley handle stems and I added the XL (Black) pedals, it does not have a lift sensor. All original accessories included are: charger, fuses, instruction manual, original boxes. This EUC sale will be for $950 through PayPal and California Pick-Up/Meet-Up only. Here are the facts for my King Song KS18L for sale in the SF Bay Area for $950: I am the original owner of this EUC and I purchased it from eWheels.com in June of 2018 (First Batch). It has 2,444 KM (1,519 Miles) on it. The battery charges to 100% (1036wh) and has only been charged with the original charger at 1.5 amps. It has never been dropped or in an accident or had an electrical malfunction (lock-up). It has never needed replacement control board, motor or batteries. It has no tire wobble, cracks or creaking, and never had a flat tire. I installed the updated trolley handle (Black Stems) and XL pedals (Black). All original accessories are included which include: charger, mud guard and screws, fuse, instruction manual and original boxes. This EUC sale will be for $950 through PayPal only and California pick-up/meet-up only. Don't learn in traffic!!! Be ready and confident first. I see these group rides videos on major streets with new riders who still have to hop-start at red lights!!! My MCM5 fan starts and stops all the time too. I loved AND hated my Z10. Loved the way it looked and loved the way it handled at low (10mph) speed. It felt very solid both on the hand and under-foot. It took much effort to master at high speed over rough pavement. I liked that it took effort to look cool on it by taming wobbles and lean-turns. But its weight/trolley handle, high-speed cap and hill performance were terrible. It looks like it can do 80mph, and feels like it can do 80mph, and when I pull up to an intersection people think I can do 80mph, but the reality of this little machine is a let down. Easily beaten by an MSX, KS18L, Monster maybe even a Rockwheel! I sold mine!!! EUC Test videos of any sort are incredibly valuable and I appreciate the effort of Marty, Matias, Chooch, Alien Rides, Miami Ron and everyone else who post Test/Fail vids. I'd really like to see Marty do this same exact test with a different KS18XL. Perhaps a local friend's wheel. These temps seem too high to be believable for such a short ride. I have a KS18L that I ride on and off-road (steep stuff in SF Bay Area and Santa Cruz Mountain base) and never saw the temperature above 70C. Is my wheel a fluke or his? Looks great, probably handles amazing and build quality is also probably great, but if the KS16x still makes that high-pitch whine I can't buy it. That KingSong motor whine is embarrassing and distracting, particularly on calm quiet nights.I fear that KingSong will just use the existing KS18L motor (which performs wonderfully) but has that terrible sound. 33 with just a wool hat! Maybe I can't hear the beeps over my heart pounding at 33 (looking like the sporting goods sale section of Walmart with every type of protective gear made). Thanks for sharing this video! Crash videos are invaluable sources of information for do's and don'ts. I have been riding for 1 year and have 3,000 miles already (on many different wheels)!!! I've never fallen and I am deathly paranoid and afraid of my future first fall. I noticed in the video that the rider is wearing boots. I have tried to ride in boots, however I couldn't get any sense of feed back from my wheel so I wear minimalist running shoes with super thin soles now. Also I wear a wrist GPS and constantly monitor my speed as Gotway tilt-back is quite gentle and since you have to push hard on Gotways anyways its easy to misinterpret tilt-back for general high-speed resistance. Down-hill on my 100V Monster I had tilt-back set to 48KPH but I was able to ride up to 55KPH without detecting tilt-back. Had it not been for my GPS, I don't know when I would have slowed down, since that Monster is deceivingly smooth at high speed. Another thing: MSX beeps are very faint with wind-rush and full-face helmet at 30MPH. Yeah, it's also available on eBay for $2,000. I don't like it with the red accents. I'll wait for @Jason McNeil to stock it! His customer service is unmatched anywhere on Earth!!! Just in prototype. KingSong is quite safety conscious.